Can I get some material? History and/or replays (hopefully). Is chainpop = wheelpop? here is the 2011 "chain pop" i talked about. It was my or milas idea to try it. It seemed maybe useful in freefall. this was really never properly utilized until bene found out you can switch between 999fps and 30fps and perform "pop bugs" before wheel reaches the ground again. To do pop wheel is required to be in air and most of the time it's not possible to do chainpop with 30fps only because the timestep is so long that wheel will reach ground on the next frame. The terminology what is chainpop and what is not is still not clear though. For example imo http://www.recsource.tv/r/zaswhenlrd is not chainpop, just many pops in same ride. That freefall rec is also only arguably chainpop. I would also emphasize chainpop is more or less saveload-only trick. 35a12 2016-08-09 23:43 and 35a14 2016-08-15 20:58 are the first 2 chainpop recs I have, none of them utilize 30-999 fps switching. After vroming these I was stuck höyling start with zweq for months and nothing was really explored until I shared the trick with Madness who told me to use it in Warm Up. On 2016-12-31 12:53 is first full rec I have with 30-999 fps shampooing that I can find which is 13.69 warm up. The definition for shampooing differs a bit depending on who you ask. I say it's any form of performing many pops in rapid succession on the same edge because then you have the griploss to pop again as a part of the trick. The under level zweq shared is not because all pops are on one a single edge. While zweq thinks it requires 30-999 fps change otherwise it's just poping. To do a pop the wheel has to be in the air while it is spinning and it also requires the bike to have a correct angle. The angle part gets tricky to explain but it's sometimes not possible at all because the angle is off even if everything else is correct. Oh and also low fps. 30-100ish. 38 is magic value that is good. 60 is also a magic value that is good. and most of the time it's not possible to do chainpop with 30fps only because the timestep is so long that wheel will reach ground on the next frame. Most of the time 30fps only is not possible because of the large timestep the bike travels further between frames and you have too much griploss (Wheel is too far from the surface) to pop again. Your limitation applies to other pops where you are approaching an edge not to chainpops that are repeated due to griploss. I did start writing a pdf during the lab pro project that explains much of the history about this project and the history of chainpops chapter is kinda finished (The language is bad because I never got around to fixing that but the content is there) including how to perform the trick and stuff. Lost of all excitement about anything because of REDACTED so the pdf was never finished. There might be some good information there though because it was written as it happened. I can either share the pdf with you in a pm in it's current form or rewrite it slightly so it can be uploaded in public. I don't want to release it in public in it's current state. I will never finish it completely and there's like 16 topics where I didn't write anything. When shampooing got really crazy is found in the final lab pro rec: 1.29 to 1.31 part. This is abusing everything I know to make smooth crazy grip parts. Also in the wu 13.45 rec. The earlier recs are not as smooth looking and very few pops are performed making the bike look twitchy and weird. Yes, sounds interesting, clip a part that can go public to give some idea how deep the Elma technical side can go in extreme. This stuff is too detailed for me to understand much so I don't want to dig it myself but it could be interesting in the article, in the big saga. For me it's interesting because: new behaviour of bike which has been utilized in an internal wr and a huge "for fun" project (lab pro 1:55) + detailed technical talk which we didn't have in 2000. Do we have consensus of the official name of the trick? If not, I'll use chainpop because I had never heard about shampoo before today. I'll see if I can cut out and fix up the chainpop part of my pdf during next week. To clarify: chainpop is currently save load only trick. Normal wheelpop has been used in at least three wrs int01 int02 and int44. Int02 goes crazy and does three wheelpops. The others are just one pop. There is also stuff going on with reverse wheelpops which might be useful. Currently no one knows a spot where it is useful (in internals). It's something that's been known for a while but no one has explored it. Could be really good in some places maybe? Maybe not since you go so far left so normal driving would be better? Who will explore this and come up with some wr style for spef? Ok, so wheelpop is not same as chainpop. Chainpop = several wheelpops in row? And ppl are able to pull wheelpops in short levels but chainpop is too difficult. Current Flat Track WR has three wheelpops? Is it public? So when wheelpop was first time used? Proof? Freefall WR by bene in table #371 (11 January 2014)? Not in Loop or Bumpy? And now reverse wheelpop too (looks cool btw). So Hangman too - which ones? Ok, so wheelpop is not same as chainpop. Chainpop = several wheelpops in row? Yeah. Chainpop is several wheelpops in rapid succession. The reason it's hard without cheating is because you have to press brake for 0.03s (one frame at 30 fps) several times on the correct frame during a short time, say one second. I've done a 4 wheelpop chain live without tools but it was in a level made for chainpoping so it was an easy spot and my rec was slower than just driving normally. I spent like 20 minutes of that rec though and managed to find a rhythm of tapping brake making it possible. And ppl are able to pull wheelpops in short levels but chainpop is too difficult. Current Flat Track WR has three wheelpops? Is it public? Yeah a single wheelpop is not hard if you have the correct setup. Or even several wheelpops in a single level. Some wheelpops are still hard though like the third wheelpop in flat track is crazy. The rec is public. You can find all the best public recs here: viewtopic.php?f=2&t=9327 This rec has a wheelpop at 2.8x (found by bene). Wheelpop at 4.4x (first used in Ded rec? ), Wheelpop at 12s (found by bene). First use is very hard to say. I think Ded flat track 14.88 has a wheelpop in it? Maybe I remember it wrong. But that would be the first public rec in an internal wr where a wheelpop was used? It's a bit before my time so you should verify with someone else Wheelpops have been known about before this though but the history of elma is shrouded in secrecy. For example zweq and milagros used them a ton in their cheated recs from 2011. They became more popular after I started exploring them which was before zweq and mila released tools and recs. Madness also explored them a lot with me. The release of these tools and recs helped a lot and to me was the start of the technical exploration part of elma. You now have the tools to examine the game frame by frame at any fps to get a better understanding of how the physics behave. I've always been good at minor details but sucking at the big picture examining frame by frame is very cool. I don't think hangman has any wheelpop in the wr by Nekit but it is 30fps. The save load rec has a wheelpop that is really easy and saves like 0.05s or something. It's probably possible to do this trick without cheats. Not in Loop or Bumpy? Bumpy doesn't have any wheelpops. I forget if loop has one but it's extremely minor and unintentional. Doing pops in that spot intentionally is slower. So I would say both of them are without pops. I have been exploring a wheelpop in the start of int14. Here is a live attempt: http://kopasite.net/up/712lg3o398ezi7y/14wowpop2.rec (wow unpublic rec made public ) this could be faster. 1. Ded's Flat Track is the oldest replay known having a wheelpop (2011-01-15). 2. The oldest replay containing 2 wheelpops is 44zdoublebug.rec (2011-12-16) but it might be easier to call just two wheelpops instead of chainpop because it's practical to have own terms for a trick that's actually possible to do and use in WR and then leave own term for technical fun. 3. bene's Freefall popularized wheelpop (2014-01-11). 4. bene drove Warm Up WR using a wheelpop (2015-04-13). 5. First time "30-999 fps chain poping" (2016-08-10). 6. Lab Pro 1:55 in FEM17 (2017-07-29). Can you explain as simply as possible how to make a wheelpop? I haven't been around since 2007 so I don't even know the very basics. You must use 30 Hz (or better: it's the easiest FPS to do it)? You tap brake (while pressing gas too) at right time to keep grip and that's it? "30-999 fps chainpop" is the most extreme way to utilize this new trick? Do you change the FPS during the drive? So you first make a wheelpop (30 FPS), then change FPS to 999 to make the wheel pop as much as possible, then back to 30 Hz and a new wheelpop and so on? How many wheelpops there are in one second in some Lab Pro spot or some other clear example? Hm so the wheel keeps the grip by making small pops? Impsy hard to understand this. 3. wasn't zweq's 11.50 older? at least that's where i've seen ff wheelpop first. I think I would summarize wheel pops as follows: they were known for a very long time, but only in the last 6-7 years it was understood how to produce them consistently and that they can be faster than norm riding. somewhere around 2008-2010 I started noticing wheel pops. Basically some time after fps limiter was created, and it was created in 2008 if i remember correctly. I didn't know why they happen and are they useful osv. Seemed like some random 30fps error behaviour to me. in 2010-2011 I understood how to make wheelpops - use lowfps, preferably 30fps, tap brake when wheel is close to the ground. 2011 or 2012 we noticed with mila it's pos to pop with frontwheel, I never understood why until bene happened. in 2016 or 2017 bene taught me wheel has to spin to make pop with either wheel. But I think bene said he is still not sure how exactly it works, is throttling needed for optimal pop or just wheel spin. Yes it's the most extreme. Yes it's changing fps during the drive to optimize. Changing fps is not a requirement. I change fps back to 999 because the bike travels less distance between frames so the earliest frame of grip loss is earlier in time. At 30 fps timer advances 1/30 seconds and bike as well so it moves a big distance. At 999 fps it's much less distance because the timestep is 1/999. This means you have many more opportunities to input brake again than when just playing 30 fps. I can't say for sure about how many pops there are but around 5-10 pops per second. I can count exactly in tas if I remember. Yes when wheelpops happen the wheel instantly moves to gain grip on the ground from one frame to the next. So instead of losing grip you get it back. Zweq 11:50 freefall might be earlier rec but it's still not public to my knowledge. So it's irrelevant to the history of pops. 44zdoublebug is one zweq shared a long time ago with me so that has helped understand things for me. But I believe it was also unpublic until his post here? It's really hard to piece together this history because so much knowledge was kept secret and shared with Mila sl. What zweq says is true with wheel spinning. I don't really know why or anything. I haven't explored it at all I just do things the way I know. I'm sure there is much to learn. I'm sure I missed like 99 questions and can't explain correctly now. I'll take another look when I get home and don't have to type on the phone. 3. Yes I believe it did. Many had not heard about it before (I had heard about it through Ded rec and knew very basics). But it became popular after I started using it and showing it's potential in other places. 4. That's when the wr table was updated. The time was made 2015-03-22 12:09 after 9 months of playing a couple of hours every day. Not an easy style to pull off at all. 6. Yeah, the finish was a few weeks before but the projects was kept 100% secret. Madness knew about something going on and that I was involved because we asked him to judge bounces. Zero knew about it a while before FEM because he was supposed to make a video but that didn't happen. iCS helped make the video though after FEM much appreciated for iCS. Here is an excerpt from the lab pro pdf I was working on earlier added some stuff changed some stuff removed some stuff and converted to lauta format let me know if this helps. You can pop with both wheels, even both wheels at the same time. The wheel has to be spinning to pop. A pop moves the wheel that is poping towards the ground to gain grip faster. A pop can be reversed so the wheel moves away from the polygon and grip is lost. I believe wheelpops can be made with any FPS but they are strong and useful between 30-100 FPS. Above 100 they become invisible but still change something. The lab pro tas is using 100 fps wheelpops in a few places that are near invisible because it's faster to pop there and lower FPS pops gives a too strong pop that makes it slower due to extra speed/rotation etc. 38 FPS is a magic value where wheelpops are the strongest but it is a good idea to test 30-45 FPS anyway if you are going for the perfect pop and then merge the results. I have recently learned that 60 FPS seems like another magic value where pops are stronger. Why is 38 FPS a magic value? Is it a magic value or am I and Madness insane to claim it? Is 60 FPS another magic value? Why do I get crazy strength wheelpops with 60 FPS? Exactly how are they performed? Can wheelpops be performed with any FPS? How do you prove it with very high FPS when they are not visible? Shampooing is something I just stumbled upon because it just happens to work so well in lab pro. There are two spots where you can easily save half a second with it. I can't exactly explain why I tried it. It just felt like a natural thing to do. Maybe watching 44zdoublebug.rec helped me think about it. A lot of knowledge was released with mila sl that helped understand how elma works. The first iterations of shampooing did not abuse fps change and the results were varying in quality. When you do a wheelpop on a non straight edge the wheel will extend outwards from the bike and gain grip. After gaining grip you will lose grip again shortly afterwards. This is because with the wheel having grip you gas on which gives the bike more rotation. So this is a pop you generally avoid. Losing grip is always bad, right? No, because once you lose grip you can pop again. All that is required is to spin up the wheel (I actually think it never completely stops by braking for just one frame when shampooing) and hope that you are not far enough from the polygon (Due to traveling at high speeds) or that you still don't have grip (Due to bike rotation) to be able to perform it. You can repeat this again and again until you eventually die because of rotating too much or until the polygon ends. This was named chainpoping - or shampooing (Thanks to Zweq for naming). In warm up I went from two wheelpops, one at the very start and one before to flower to around 10-16 wheelpops. 10 in the start and 6 at the flower. Let's try to explain it with a frame by frame breakdown of the first two pops in warm up. The whole chain starts with a normal wheelpop, this is something that is done in almost every rec under 14s. The only exception I know of is the Kazan tas rec. On this frame you can see the frame where the first pop is performed. This is where you need to be using low FPS and tap brake for a single frame. I usually tap pause in TAS while holding the brake key down. There is a 0.03s window to tap the pause key. If you go too far you will brake on the ground, if you go too little the game won't advance one frame. Usually I just go with 38 FPS but in warm up I tried 30-45 FPS. This frame shows the results after the pop. This is the frame after and now we should start gasing to lose grip. Without shampooing this is where you would accept you lose grip and do an alovolt later to align for the turn. Going to high FPS will give you better results because you get an earlier frame of griploss but that is really abusive and we can start to question if it really should be acceptable to spam different FPS values this much. In the warm up tas I did change FPS. Now that the bike has lost grip we head back to low fps and tap brake for a frame again. In the frame above you can see the earliest frame where the next pop is possible. It looks like the bike still has grip so if you want to find this frame you are going to have to frame advance and try all frames to find the earliest. Or just take the first frame where you can see that the wheel has lost grip. Both are oke. It depends on what you are going for and it's good to explore and test different things. It is not always best to take the absolute first frame where it is possible. On this frame we have now done the first pop in the chain. Now just repeat this until you die, the polygon ends or it is not possible any more. It's kinda funny that I did not even realize after doing shampoos in lab pro just how important this can be for so many levels. It was something I found very early in the project. It was not until months later after one of my random chats with Madness where I showed him some of my "recent" pop techniques and he suggested I do it in warm up that I realized that this trick has the potential to improve several seconds across all the world records in the tas wr table. So much for my statement that a non wheelpop table will just be a few seconds different from the Madness tas table, we just added several seconds on top of that. There will be an even greater difference between the (Not yet existing) 1000 fps table and fps change table - if not for fps alone there will be because of wheelpops. bene: you don't have the PDF anymore? It might be more interesting looking than a generic Mopolauta post. Playing live is playing without save/load or tas, just regular elma. No idea I never gave it any thought or experimentation at all. I was able to reverse pop by feeling rather than by knowing. Would love to see some research. i have a theory about the 38 & 60 fps riddle (i almost fell of my bed when i realized this): the value of the golden ratio is 1.6180339887 and if you multiply 6180339887 with 0.6180339887 you'll get 38192820101.5. so i suspect the two "magical" fps values isn't 38 & 60 but rather 38 & 62. try it out and let me know if it helps. Ok so now bene can try to beat his WR using the 62 and we will know. 100 is the next good? Spent a lot of time braining this and sketching in mspaint and this is the theory I came up with. Not sure if it's correct and I'm very noob at physics so duno how well I can explain. Also I'm very tired so not sure how much sense this will make. I think there are two different effects causing pops. Which one has the most effect depends on moment of the bike and angle to the ground. Full Bike effect: Rotation of the wheel is transfered into rotation of the whole bike. This is easy to see if you are free-falling and try to accelerate and brake. Wheel effect: Rotation of the wheel stops. img01: Wheel is rotating clockwise. img02: Braking causes the wheel to stop rotating, and all the energy is transfered in a single frame(?). When you stop rotating clockwise, that means the wheel is going to rotate the opposite direction (anti-clockwise) for one frame. img03: Braking will also cause the whole bike to rotate anti-clockwise. The whole bike 'wants' to transfer the rotational energy to the bike, but instead it is transfered as grip directly to the wheel. I imagine it kinda like the backwheel wanting to go up in the air, but instead the grip of the wheel is holding it down. The wheel trying to 'lift-off' the ground trumps the other effect. Notice that we are alovolting here, so the wheel and bike is already being pressed towards the ground. 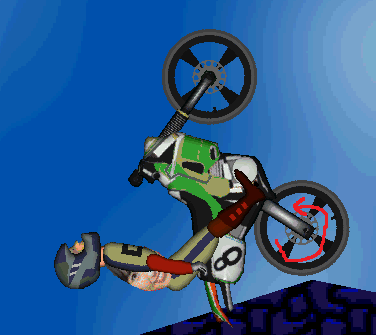 The anti-clockwise effect on the whole bike does not have an effect on the wheelpop because it can't make the wheel leave the ground at this angle. This is probably the deciding factor of which direction the pop will go, whether the rotational effect (the effect which makes the backwheel drop), can make the wheel go off the ground or not. It's probably more complicated than this, and yeah I don't know physics very well so my terms are quite random, maybe I'm partly right and maybe I'm totally off, no idea. If anything scientific it probably proves that throttle is not what makes it pop (as you can't throttle both ways), but this is easily testable without double popping so it's probably just a fun/cool trick. Last edited by danitah on 29 Mar 2018, 03:02, edited 3 times in total. why is it called storage bug? Stolen name from some other game that has a storage trick imo it was wind waker but maybe I remember wrong. Wheel goes up, wheel goes down. You can't explain that.